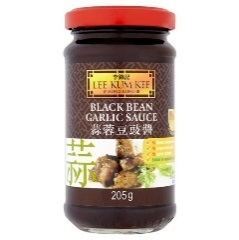 The Year of the Pig begins on 5 February 2019 – and to mark Chinese New Year, Lee Kum Kee has brought together the best of Chinese and British cuisine to inspire and celebrate the mix of two great cultures. Britain is a melting pot of culinary flavours, experiences and creativity, with Chinese food a firm national favourite. Ken Hom is widely regarded as one of the world’s greatest authorities on Chinese cooking, with six decades of cooking experience and a legacy that has helped Westerners learn to cook better Oriental cuisine; and Gizzi Erksine is an Asian food aficionado who has brought her world travel experiences into British kitchens through her approachable modern cooking style. Together they have created eight British-Chinese recipes that represent the best of a fusion of East and West. 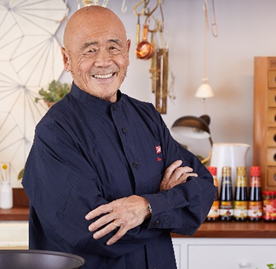 Ken Hom has recreated four Chinese classics with a distinctly British set of ingredients whilst Gizzi Erskine has taken some of Britain’s most beloved dishes and given them an Oriental makeover. 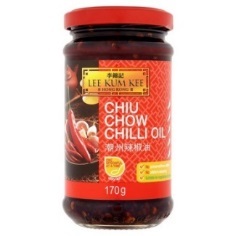 The combination of British ingredients and authentic Chinese sauces have created simple-to-cook dishes that will help families and urban foodies see how Lee Kum Kee’s store cupboard staples like their iconic Premium Oyster Sauce and Chiu Chow Chilli Oil can revitalise mealtimes. 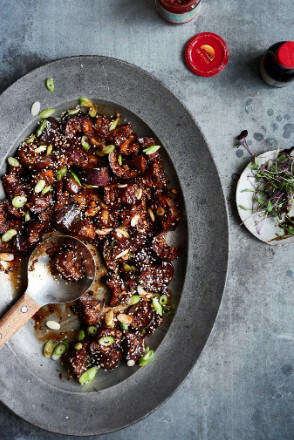 With recipes ranging from Gizzi Erskine’s Soy Roast Chicken to Ken Hom’s Vegan Friendly Sichuan Dan Dan Noodles, there is something for everyone. 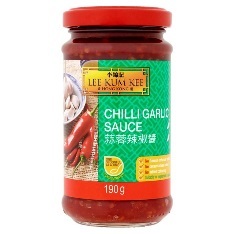 Lee Kum Kee sauces are famous across China, with a proud 130 years of rich culinary heritage their authentic products are made from the finest ingredients and can be found everywhere from home kitchen cupboards to alongside the stoves of Michelin-starred chefs. 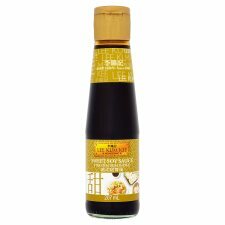 The company is passionate about promoting Chinese cuisine worldwide and making authentic Chinese cooking sauces available to everyone. 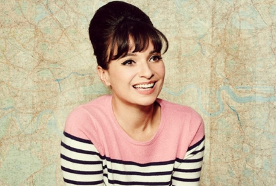 Gizzi Erskine is the presenter of several food TV shows, most recently Seoul Food for BBC America, and has been a columnist for The Sunday Times Magazine for almost three years. She’s helped launch food Mecca Mare Street Market, is imminently opening sustainable burger bar “F!LTH” and currently having success with the release of her fifth book SLOW. 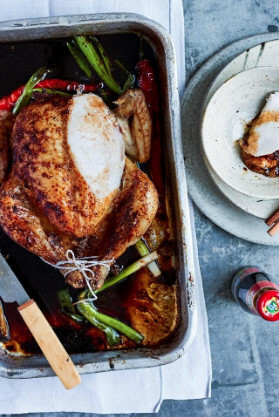 Soy Roast Chicken; a great British classic roast with an aromatic twist, featuring Light Soy Sauce, Dark Soy Sauce, Oyster Sauce and Chinese five spice. 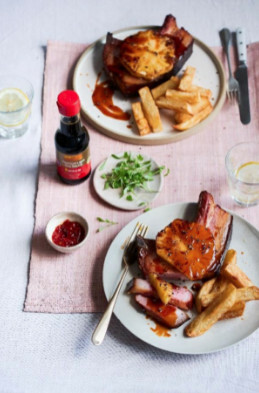 Kung Pao Glazed Gammon & Pineapple; taste the happy marriage of cultures with this spicy take on honey-glazed gammon. Serve with chips or sushi rice. 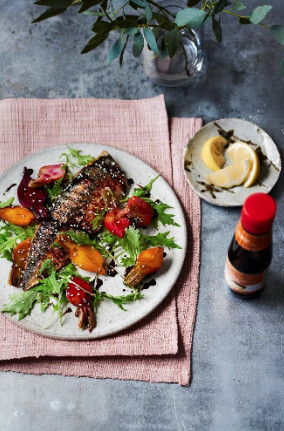 Pan Griddled Mackerel with Soy Glazed Beetroot; a delicious dish bursting with flavour, from the smoky mackerel and savoury soy glazed beetroot. Sprinkle over mizuna leaves and serve alone or with plain rice. 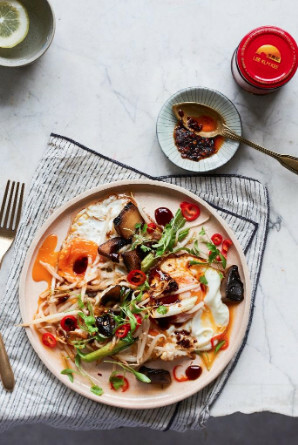 Portobello Mushroom, Beansprout & Spring Onion Crispy Broken Eggs; a quick to cook and flavour packed dish, which can easily be made veggie friendly by replacing the Premium Oyster Sauce with Sweet Soy Sauce and Chiu Chow Chilli Oil – yum! 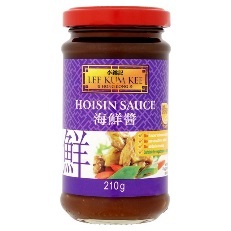 Ken Hom is a stalwart of Chinese cooking. With roots in China, the USA and Europe, Ken understands better than most the unique challenges and opportunities that arise from living in a multicultural environment. He has enjoyed a career as an author, broadcaster and overall authority on Chinese cuisine who has helped British consumers better understand the joy of cooking Oriental food at home. 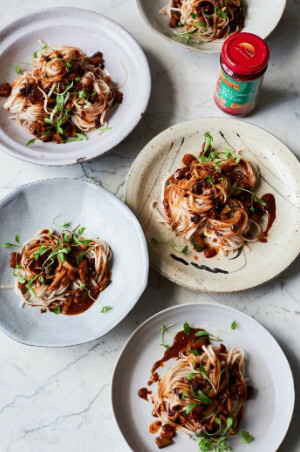 Vegan friendly Sichuan Dan Dan Noodles; traditional dandan noodles are given a mouth-watering, vegan twist using Chilli Garlic Sauce, Premium Dark Soy Sauce and peanut butter. My Mother’s Braised East-West beef Stew; a tribute to his mother’s cooking, Ken creates a warming beef stew with classic Chinese flavours and traditional Western ingredients. Savoury Duck with Oyster Sauce; succulent duck breast is marinated in Premium Light Soy Sauce, Shaoxing rice wine and Chiu Chow Chilli Oil for a simple light and flavour-packed dish. Braised Spicy Aubergines; perfect for vegetarians this aromatic recipe combines tangy aubergine and chopped spring onions for a quick to cook dish, perfect for lunch or dinner. Cut the duck breasts into thick slices 4 cm (1½ in) long x 1 cm (½ in) thick. 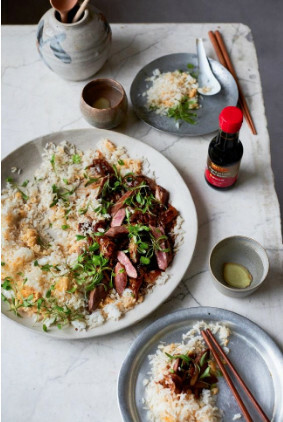 Put the duck slices into a bowl and add the soy sauce, rice wine or dry sherry, sesame oil, salt, pepper and cornflour. Mix well and let the slices steep in the marinade for about 15 minutes. Heat a wok or large frying-pan over high heat until it is very hot. Add the oil, and when it is very hot and slightly smoking, add the duck from the marinade and stir-fry for about 2 minutes. Remove the duck and drain it in a colander. The duck should be slightly pink. Pour off all but 1½ tablespoons of the oil and re-heat it over high heat, add the garlic and onion and stir-fry for 3 minutes or until the onions are brown and soft. Turn the heat to low and add the oyster sauce, rice wine, chilli oil and sugar and stir for 2 minutes. Return the duck to the wok or pan. Stir to mix well, toss in the coriander sprigs and serve at once with plain rice. Trim and cut the aubergines into 2.5 cm (1 inch) cubes. Sprinkle the cubes with salt and leave them in a sieve to drain for 20 minutes. Then rinse them under cold running water and pat them dry with kitchen paper. Heat a wok or large frying-pan over high heat until it is hot. Add the oil, and when it is very hot and slightly smoking, add the garlic, ginger and spring onions and stir-fry them for 30 seconds, then add the aubergines and continue to stir-fry for 1 minute. Then add the rest of the ingredients. Turn the heat down and cook uncovered for 10-15 minutes until the aubergine is tender, stirring occasionally. Return the heat to high and continue to stir until the liquid has been reduced and has thickened slightly. Turn the mixture onto a serving dish and garnish with the chopped spring onions tops. Heat the oil in a wok or frying pan, over a very high heat. First fry the mushrooms for 3-4 minutes until their juices start to run and they begin to caramelise. Next add the spring onions, followed by the beansprouts and cook for 1 minute, keeping all the veg moving. Remove from the pan and set aside. Add another large glug of oil to the wok and allow to get really hot. Crack the eggs into the wok, sprinkle with salt, and fry for 1 or 2 minutes, until the whites begin to crisp up but the yolks are still runny. Add the vegetables to the eggs, and with a spatula carefully fold one half of the eggs over the top. Don’t worry if the eggs break, that’s why it’s called broken eggs! Slide the eggs onto a plate, and drizzle the oyster sauce all over, followed by the oil from Chiu Chow Chilli Oil. Sprinkle with white pepper, the fresh chilli and lastly the coriander before serving immediately. If you are vegetarian you can replace the oyster sauce by mixing together 1 tablespoon of Sweet Soy Sauce mixed with 1 tablespoon of the oil and chilli seeds from the Chiu Chow Chilli Oil. Heat a wok or large frying pan over high heat and add the oil. Add the courgette, garlic, ginger and stir-fry for 1 minute. Add the rest of the ingredients. Reduce the heat and simmer for 3 minutes over low heat. Cook the noodles in a large pot of boiling water according to the pack instructions. Drain them well in a colander. Divide the noodles into individual bowls and ladle the sauce over them. Serve at once. Blanch the beef for 10 minutes in boiling water, drain well in a colander, and pat dry with paper towels. Put the tomatoes into a food processor and blend for just a few seconds or put them through a food mill. Set aside. Heat a heavy casserole pot over moderate heat, add the olive and peanut oil, and slowly brown the beef on all sides. Remove them with a slotted spoon and pour off the excess fat and oil, leaving just 1 tablespoon. Add the onions and garlic, and cook for a few minutes until they are translucent. Add to the onions and garlic the beef, tomatoes, plum sauce, hoisin sauce, Shaoxing rice wine or dry sherry, lemon zest, soy sauce, salt, and pepper. Bring the mixture to a boil, lower the heat, cover, and simmer for 1½ hours, or until the beef is tender. Skim the fat from the surface from time to time. Add the carrots, turnips, and potatoes and cook, covered, for 20 minutes or until tender. Add the olives and heat them through. Skim off any surface fat and serve at once with plain rice on the side. Mix together all of the marinade ingredients together in a small bowl. Place the chicken on a roasting tray. Pour the marinade all over the chicken, massaging it into the skin, and stuffing the ginger pieces and chilli into the cavity of the chicken. Allow to marinate for at least 1 hour, but preferably overnight. 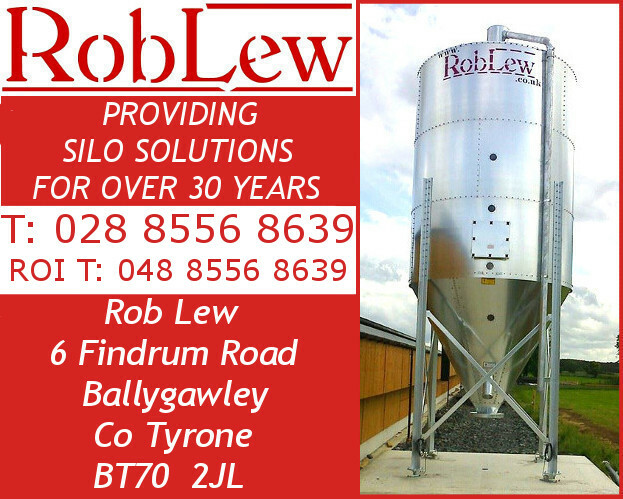 Once the marinating time is up, preheat the oven to 190C / 160C fan oven / Gas mark 5. Now this next bit is a little fiddly, but trust me it’s worth it. With a needle and thread, carefully sew up the skin around the base cavity of the chicken, (blanket stitch is ideal for this), so that it is as tightly sealed as possible. Pour off the marinade into a jug. Give the roasting tray and wash, and then lay the spring onions in a line to act as a trivet for the chicken. Next, pour the marinade back into the cavity of the chicken through the neck cavity. Gently place on top of the spring onions being careful not to lose any juices. Finally, sew the skin of the neck cavity up to contain all of the marinade within the chicken. Drizzle the groundnut oil over the chicken, and season liberally with salt. Put in the oven for 1 hour 10 minutes, depending on the size of the bird. Allow the chicken to rest for 20 minutes before serving. To serve; cut through the part of the chicken that’s been sewn together and Pour out the juices. Carve the chicken either British or Chinese style and serve. 2 x 2cm thick rounds of fresh pineapple, peeled and cored. First, if you have time, soak the gammon in cold water for 2 hours, to help remove some of the saltiness. 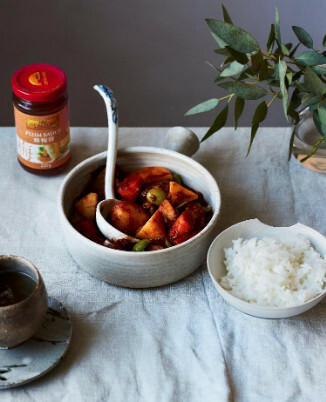 To make the glaze, add the soy sauce, plum sauce, rice vinegar, ketchup, pineapple juice, Chiu Chow Chilli Oil and Chinese five spice together into a small saucepan, and place over a moderate heat for about 5 minutes, whisking until combined. Take off the heat and whisk in the butter until it has emulsified into the sauce. Set aside. In a frying pan, heat the oil over a high heat. Once the pan is smoking hot, add the gammon chops and fry for 2 minutes on each side. I like to put a saucepan to weight the gammon down to achieve a really good caramelisation, remove from the pan and set aside. Wash the pan, return to the heat, and add a little more oil before adding the pineapple. Fry on each side for a couple of minutes. Don’t worry if the pineapple gets a little charred, you actually are aiming for that as this adds another dimension to the final flavour. Place one round of pineapple on top of each gammon steak. Pour over the glaze, allow to bubble for a few seconds. Serve immediately the traditional British way, with chips! Or alternatively with sushi rice or plain rice. To make the beetroot, place them with their skins and roots still on, into a pan of water and bring to the boil. If you have managed to get all three colours, (yellow, candy striped and purple), you will want to do this in separate pans so the purple ones don’t stain the others! Cook for approximately 10 minutes until tender. Remove from the pan and refresh in cold water. The skins should rub off easily now, but keep the roots on as they look pretty. Add the soy sauce, rice vinegar, sesame oil and sugar, and put over a moderate heat for 10-15 minutes until it has reduced and turned into a thick glossy glaze. Add the beetroots to the pan and gently coat them all over with the glaze. Put to one side whilst you cook the mackerel. Put a griddle pan over the biggest highest flame and get really hot to the point of it starting to smoke. Rub a little olive oil onto the skin side of the mackerel fillets, followed by a liberal seasoning of salt. When the pan is hot enough, place the mackerel skin side down, and fry for 2 minutes on each side. Remove from the pan and serve immediately with the beetroots and dress some mizuna leaves with the leftover glaze a little lemon juice, salt, pepper, olive oil and a sprinkling of sesame seeds.